Numerous rivers also passed through the area, the most important of them being the Donets Basin, Western Dvina, Dnieper, Desna, Volost' and Ugra rivers. None of these rivers were especially wide at 10–120 m (33–394 ft) respectively, nor deep at 40 to 250 cm (1.3 to 8.2 ft) respectively; but the surrounding wide, swamp-like areas proved difficult to cross, especially for mechanized troops. Moreover, like many south-flowing rivers in Europe, the Dnieper's western bank, which was held by German troops, was higher and steeper than the eastern. There were very few available bridges or ferries. The Western Front had assigned for the operation the 10th Guards Аrmy, 5th Army, 10th Army, 21st Army, 33rd Army, 49th Army, 68th Аrmy, 1st Air Army, 2nd Guards Tank Corps, 5th Mechanised Corps, 6th Guards Cavalry Corps. The Kalinin Front would have for the operation the 4th Shock Army, 39th Army, 43rd Army, 3rd Air Army, 31st Army. After a day of probing, the goal of which was to determine whether German troops would choose to withdraw or not from the first set of trenches, the offensive started on 7 August 1943 at 06:30 (with a preliminary bombardment starting at 04:40 am) with a breakthrough towards Roslavl. Three armies (apparently under the control of Soviet Western Front) were committed to this offensive: the 5th Army (Soviet Union), the 10th Guards Army, and the 33rd Army. As ordered by the Stavka (the Soviet Armed Forces Command), the Dukhovshchina-Demidov offensive operation (Russian: Духовщинско-Демидовская наступательная операция) near Dukhovshchina started almost a week later, on 13 August. As on other parts of the front, the 39th Army and the 43rd Army encountered serious opposition. During the first day alone, Wehrmacht troops attempted 24 regimental-sized counterattacks, supported by tanks, assault guns, and aviation. By mid-August, the situation on the Eastern Front had changed as the Red Army started a general offensive, beginning with the Belgorod-Khar'kov Offensive Operation (Белгородско-Харьковская наступательная операция)(Operation Polkovodets Rumyantsev) (операция "Румянцев" - 3–23 August) and the Orlov offensive operation (Орловская наступательная операция) (Operation Polkovodets Kutuzov) (операция "Кутузов" - 12 July - 18 August) otherwise known as the Battle of Kursk, and continuing with the Wehrmacht's defensive Battle of the Dnieper line in North Ukraine. Nevertheless, the Wehrmacht command was still reinforcing its troops around Smolensk and Roslavl, withdrawing several divisions from the Oryol region. 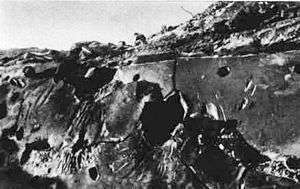 As a result, the two Soviet counteroffensives that followed the Kursk defensive operation (Курская оборонительная операция 5–23 July) proceeded relatively easily for the Red Army around Oryol, creating a large salient south of Smolensk and Bryansk. 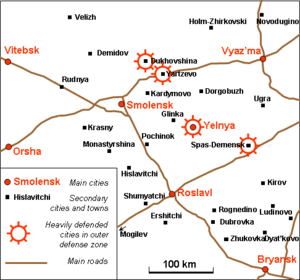 The Yelnya-Dorogobuzh offensive operation (Ельнинско-Дорогобужская наступательная операция) was considered the "key" to Smolensk and Wehrmacht troops created a massive fortified defensive position around the city. Swampy areas on the Desna and Ugra rivers were mined and heavy guns set up on hills overlooking the city. Soviet troops moved forward after an intense 90-minute shelling. 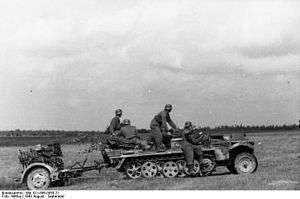 The artillery bombardment as well as ground attack aircraft significantly damaged Wehrmacht lines, allowing the Red Army to execute a breakthrough on a 25 km (16 mi) sector front and advance 6–8 km (3.7–5.0 mi) by the end of the day. 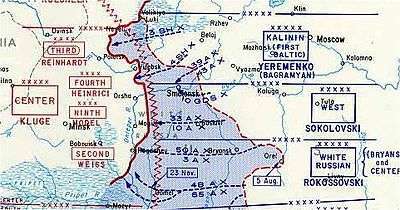 The following day, 29 August, Red Army rifle divisions advanced further, creating a salient 30 km (19 mi) wide and 12–15 km (7.5–9.3 mi) deep. In order to exploit the breakthrough, the 2nd Guards Tank Corps was thrown into the battle. In one day, its troops advanced 30 km (19 mi) and reached the outskirts of Yelnya. Leaving Wehrmacht troops no time to regroup their forces, Red Army troops attacked the city and started to form an encirclement. On 30 August, Wehrmacht forces were forced to abandon Yelnya, sustaining heavy casualties. This commenced a full-scale retreat by Wehrmacht troops from the area. By 3 September, Soviet forces had reached the eastern shore of the Dniepr. The Smolensk operation was a Soviet victory and a stinging defeat for the Wehrmacht. 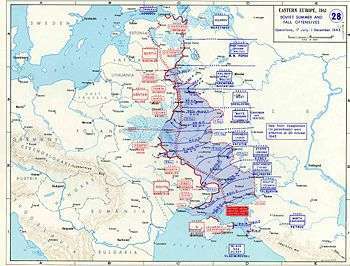 Although quite modest compared to later offensive operations (not more than 200–250 km (120–160 mi) were gained in depth), the Soviet advance during this operation was important from several points of view. ↑ Marshal A.M. Vasilevsky, The matter of my whole life, Moscow, Politizdat, 1973, p. 327. ↑ K. Rokossovsky, Soldier's duty, Moscow, Politizdat, 1988, p. 218. ↑ A.A. Grechko and al., History of Great Patriotic War, 1941–1945, Moscow, 1963, t. 3, p. 361. ↑ Operations of Soviet Armed Forces during the Great Patriotic War 1941—1945 (collective work, part written by V.P.Istomin), tome 2, Voenizdat, Moscow, 1958. ↑ Marshal A.I. Yeremenko, Years of retribution, Moscow, Science, 1969, pp. 51—55. ↑ World war 1939–1945 (collection of essays), Moscow, Ed. Foreign Lit., 1957, pp. 216–217.